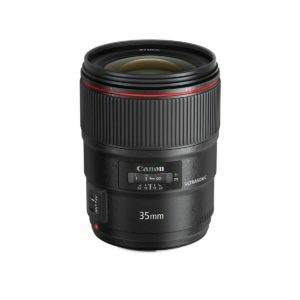 The Canon EF 35mm f/1.4L II USM wide angle prime lens is the second generation version of the ubiquitous wide and fast lens for Canon Full frame bodies. It can also be mounted on APS-C bodies, yielding a 44mm equivalent field of view. The lens is quite large and heavy, but that is typical for this class of lens, although the Sigma 35mm f/1.4 art is a bit smaller in diameter. Either the canon is a little over engineered or the Sigma is a little under, or both. based on 38 user reviews online.